Nerses Nalbandian was an Armenian emmigrant who became Ethiopia's national maestro in the the 1950s. The Emperor Haile Selassie appointed him director of music at the National Theater when it was opened in 1955. In 2004, during their first trip to Addis Ababa, the E/O met Nalbandian's children, who determined that the E/O was the right band to revive their father's music. 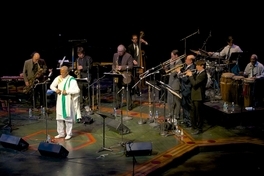 IN 2011, the E/O returned to Ethiopia and performed several concerts of Nalbandian's music along with several Ethiopian collaborators, including one show at the very National Theater where Nalbandian had worked. In the winter of 2016, the prestigious Ethiopiques series, from Buda Musique in France, will be release a compilation of live and studio recordings by the E/O, documenting the range of his band music. "Bandleader/composer Gershon’s greatest hour (or closer to an hour and a half)...[the] long-form piece bridged the sounds of Ethiopia with Latin music as well as the diverse jazz and rock elements in the composer’s DNA. His arrangements conjured rich, sublimely wound horn cadences...the musicians hit their marks with precision and finesse. The University of Alberta's Festival of Ideas, directed by Miki Andreevic, gave us the opportunity to do three concerts with our friend, the great Mahmoud Ahmed in November of 2012. We recorded the shows - look for a CD of some of the live material we have been accumulating over the past few years of performing with Mahmoud. In the mean time, you can buy a DVD of a French documentary about our first meeting with him in 2006 right here. Excerpts are viewable on YouTube. Thanks to all 96 of you who donated to our Kickstarter fund, as well as the US and Spanish Embassies and the Alliance Ethio-Francaise, all in Addis Ababa. We played five concerts and conducted a big clinic for the students of three jazz schools. Two of the concerts featured the historic music of Nerses Nalbandian, Ethiopia's Maestro for many years, and three of the concerts featured an assortment of E/O originals and Ethiopian favorites. Girma Negash, Bahta Hewet, Beti and Michael Belayneh, vocals; Dawit Frey, clarinet; Jorga Mesfin, tenor sax; Fasika Hailu, krar; Girum Mezmur, guitar; Henock Temesgen, bass. Video of Girma Negash, Dawit Frey and the Either/Orchestra performing Yene Hassab. The NYC Edition was a sold-out smash success. Three hours of continuous music, and the audience was ready for more. 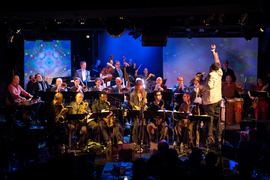 Russ Gershon and the Either/Orchestra wish to thank our alumni: John Medeski, Matt Wilson, Josh Roseman, Mike Rivard, Harvey Wirht, Dan Kaufman, Jeremy Udden, Douglas Yates, John Carlson, Bob Nieske, John Dirac, Curtis Hasselbring, Jerome Deupree, Dan Fox, Russell Jewell, Henry Cook, Godwin Louis, Jeremy Udden, Douglas Yates, Teshome Mitiku - all onstage - and a.minor (video art), Phil Davidson (sound), David Fisher and Brad Braufman (video documentation), Linda Somma, Gabrielle Agachiko and Israel Dejene (various other tasks), Terri Hinte (publicity), along with the incredible staff of Le Poisson Rouge! The December 16 edition of the concert in Arlington MA was "an unforgettable confluence of talent" - here's a review.